The Great Recession was a period between 2007 and 2009 when the housing bubble burst and employment, GDP and the stock market plummeted for the longest period since World War II. The Great Recession was a period between December 2007 and June 2009 that saw the 2008 financial crisis, some of the worst unemployment rates, GDP, and economic disasters since World War II. The Great Recession was brought on by several factors, mostly related to the faux paws of the housing and banking industries - the subsequent effects of which devastated U.S. and European economies. According to reports, real gross domestic product (GDP) fell some 4.3% from a high in fourth-quarter 2007 to its low in second-quarter 2009 - and, to boot, the unemployment rate skyrocketed from 5% in 2007 to 10% in October of 2009. While there were many contributing factors to the Great Recession, much of it had to do with the "too big to fail" mentality focused on large banking and housing institutions, as well as the growing housing boom during the mid-2000s. And, the subprime mortgage crisis, brought on by the issuing of risky housing mortgages, caused housing prices to plummet 30%, bringing the stock market down with it (with the S&P 500 (S - Get Report) falling 57% over two years). But how did the longest recession since the 1940s happen? What caused it? And, how did the economy recover? While there may be several causes of the Great Recession, some of the key reasons for the crisis were due to the Federal Reserve's inability (or failure) of regulating the financial sector, the financial institution's risky behavior (especially in regard to unadvisable mortgage lending), and an exuberant amount of borrowing by consumers or corporations without regard to the financial implications. The 'subprime mortgage crisis' was brought about by banks and financial institutions issuing high-risk candidates mortgages they couldn't afforded. Subprime mortgages are typically mortgages granted to people with low credit scores (often in the low or below 600s), which are high risk for the lender. During the mid-2000s, the housing market was booming - one of the main reasons was that banks were giving mortgages to high-risk candidates in order to fill up risky securities and bonds that they sold to investors in a pretty package, calling them AAA-rated (low-risk) securities (which simply was inaccurate). Additionally, securities called private-label mortgage-backed securities (PMBS) funded most of the subprime mortgages. Still, institutions invested in these risky bonds because of their misleading AAA ratings, causing demand for housing to increase (due to how it was much easier to get a mortgage loan). However, the housing bubble couldn't last forever - and soon home owners couldn't pay their mortgages. Because refinancing or selling homes at the astronomically high prices wasn't a viable option for paying off their mortgages, mortgage loss rates started skyrocketing for investors and lenders alike. And, in April of 2007, one of the leading subprime mortgage lenders New Century Financial Corp. filed for bankruptcy - and the bubble began to burst. More subprime lenders began closing due to how the mortgage-backed securities were becoming rated as higher-risk. Without those options, housing demand began to take a dive, and prices fell drastically. And, within a short time, government-backed Fannie Mae and Freddie Mac suffered enormous losses due to their outstanding loans allocated for mortgage-backed securities (which they sold to investors as prime bundles). The federal government took them over in 2008, and the number of home foreclosures and repossessions increased drastically. The bust of the housing market, brought on by the subprime mortgage crisis, majorly impacted the Great Recession, as it decreased construction, consumer spending, financial institutions' operations, and investment and securities markets, according to reports. So, the subprime mortgage crisis both collapsed the housing market, and created mistrust between banks (not wanting to lend to each other), which majorly impacted the 2007 banking crisis and the Great Recession overall. While the stock market was actually reaching market highs in 2007, with the Dow Jones Industrial Average (DOW exceeding 14,000, by the next year it lost more than half of its value due to the untenable stock market (resting at just 6,547) - costing thousands of Americans enormous amounts invested in the stock market. American households and non-profits reportedly lost around $14 trillion in net worth. To combat the drastic dip in investment and loans, the Fed reduced the national target interest rate to zero percent for the first time ever (from around 5.25% in 2007). Additionally, President George W. Bush introduced the Economic Stimulus Act, which, among many things, doled out tax rebates, reduced taxes, provided businesses with incentives to invest capital, and increased loan limits for those like Fannie Mae and Freddie Mac to encourage taking out loans and bolster the economy. But, the package couldn't save the drowning economy, further progressing the Great Recession. Another major facet of the Great Recession was the "too big to fail" modus operandi regarding the banking system. When major investment banking player Bear Stearns called it quits after losing big on its investments in subprime mortgages, as well as assets obtained through fellow banking giant JPMorgan Chase (JPM - Get Report) . Following in Stearns' unfortunate footsteps, Lehman Brothers declared bankruptcy just a few months later, which was reportedly the largest bankruptcy filing in U.S. history. Worried that this was becoming a pattern, the Fed decided to lend AIG (AIG - Get Report) , an insurance and investment company, a hefty $85 billion to keep it from closing its doors. But, the conundrum many faced was - were these companies "too big to fail," or was the government propping up already-failing companies pointlessly? Additionally, the Federal Deposit Insurance Corporation, or FDIC, took control of Washington Mutual (AWSHX - Get Report) in 2008, which, at the time, was the largest savings and loan following a 10-day bank run. In the same year, both Goldman Sachs (GS - Get Report) and Morgan Stanley (MS - Get Report) converted from investment banks into bank holding companies in order to be more eligible for bailing out. Unemployment: The national unemployment rate rose from 5% in December 2007, to 10% in October 2009. Mass layoffs: Mass layoffs (occurring when 50 or more claims for unemployment insurance are filed from one employer) involved 326,392 workers in just February of 2009. Foreclosures: An estimated 3 million households were foreclosed on from 2005 through 2009. GDP: GDP declined by 4.3% from 2007 to 2009. Stock market: The Dow Jones Industrial Average declined by 50% in 2007, plummeting more in the following years to a low of under 10,000 for the first time ever. The S&P 500 declined by 57.8% from 2007 to 2009. In order to prevent the total collapse of the financial sector, President Bush created the Troubled Asset Relief Program (TARP) in October of 2008, hoping to allocate some $700 billion in funds to buying assets from struggling companies in order to keep them afloat. Funds from TARP were used to bailout the likes of General Motors (GM - Get Report) and Chrysler (F - Get Report) (together, some $80 billion), while a hefty $125 billion was used to help out Bank of America (BAC - Get Report) in 2009. Fresh into his presidency, President Barack Obama signed the American Recovery and Reinvestment Act in February of 2009, a massive stimulus package that allotted $787 billion as foreclosure relief, tax cuts, spending on infrastructure and more. According to the Congressional Budget Office, TARP cost taxpayers over $32 billion. 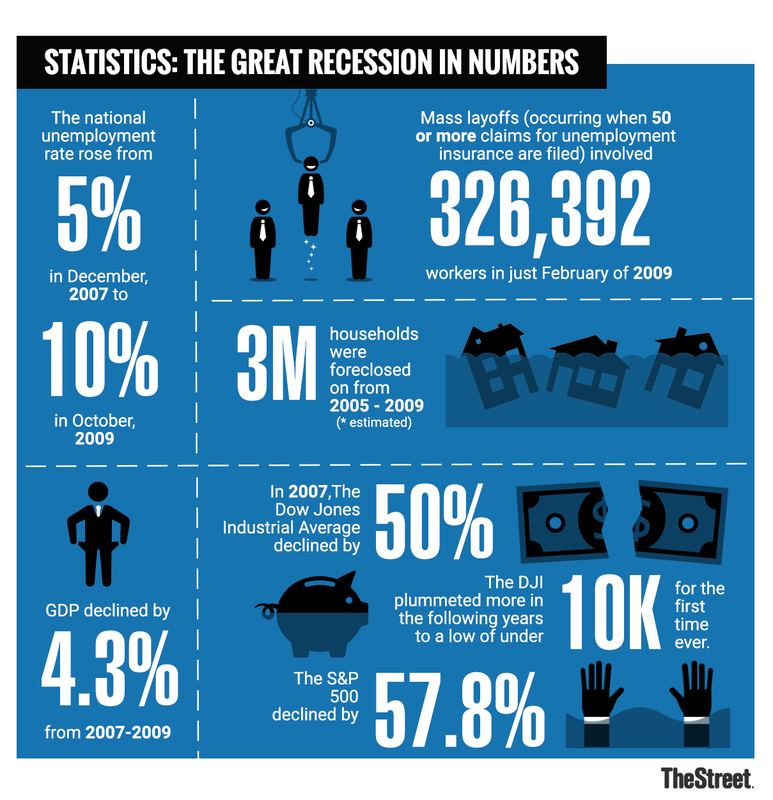 Still, the Great Recession was considered to be over in 2009. In an attempt to undo possibly harmful legislation like the 1933 Glass-Steagall Act (which allowed banks to merge to create "too big to fail"-size conglomerates), the Dodd-Frank Act was passed in 2010. The act gave the federal government the ability to take over banks if they were thought to be on the edge of collapse, as well as prevent so-called "predatory lending" to under-qualified borrowers. However, President Trump has recently made moves to alter the act. How Did the Economy Recover From the Great Recession? Well, to some extent, it still hasn't. The recession was officially over in 2009, but its effects are still being felt. Many homeowners are still "underwater" - meaning they are trying to deleverage their homes because their mortgages are worth more than their homes. And, recent reports seem to suggest another housing bubble may be forming in 2018. It seems as though another recession may be in the works already.